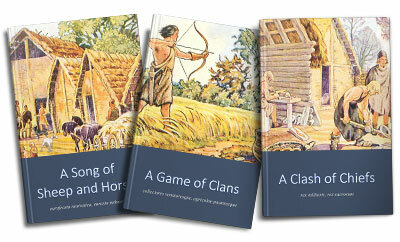 A Game of Clans: collectores venatoresque, agricolae pastoresque and A Clash of Chiefs: rex militaris, rex sacrorum are the second and third volumes respectively of a series of books called A Song of Sheep and Horses, which includes linguistic data in the first volume, A Song of Sheep and Horses, and supplementary maps and graphics in volume 4, A Storm of Hordes. These two volumes address the Proto-Indo-European Urheimat or homeland problem from a wide anthropological perspective, using archaeology and cultural and biological anthropology. More specifically, it integrates the most recent genetic research with the prevalent anthropological theories on migration routes from the Mesolithic to the Bronze Age. Beyond a precise physical location of North-West Indo-Europeans, Late Proto-Indo-Europeans, and Uralians, archaeology and population genomics can offer important hints about the actual material culture, society, economy, religious beliefs, and political organization of each of these ancestral groups. Both volumes represent a thorough revision of the essay Indo-European demic diffusion model (see below). HTML5 version (v. 1.15) with navigation help, recommended for online reading from any device, including phones and tablets. WebHelp version (v. 1.15) with plain HTML and navigation help, for online reading (preferably computer). Български • Čeština • Dansk • Deutsch • Français • Español • فارسی • Ελληνικά • Hrvatski • हिन्दी • Italiano • Latviešu • Lietuvių • Magyar • Nederlands • Norsk • Polski • Português • Română • Русский • Slovenski • Slovenský • Српски • Suomi • Svenska • Türkçe • Українська. or manually paste the Table of Contents HTML site to the Translation box. ePub Version (v. 1.15) for reading devices. .MOBI Version (v. 1.15) for reading devices. .AZW3 Version (v. 1.15) for Kindle and other reading devices. 9 MAR 2019 :: (v. 1.16) New data on Sahara Neolithic. New date for Hajji Firuz outlier (now BA). 6 MAR 2019 :: (v. 1.15) Additions and corrections related to the latest analysis of data from Wang et al. (2018). New information from recent archaeological and genetic papers. Images to illustrate certain sections. 7 FEB 2019 :: (v. 1.1) Additions of information from latest papers and genomic data, as well as new images of steppe/steppe-forest regions. 23 JAN 2019 :: (v. 1.09) Minor corrections to sections on Indo-Europeans and Uralians; added new data to East and West Semites and Greeks and Philistines. 21 JAN 2019 :: (v. 1.08) Minor formal corrections; additions/corrections to sections on Uralic/IE; two images (BBC-CWC burials and Amesbury archer) added. 19 JAN 2019 :: (v. 1.07) Minor changes to Introduction; formal corrections to other sections (use of dashes, punctuation, etc.). 18 JAN 2019 :: (v. 1.06) Minor formal corrections. 17 JAN 2019 :: (v. 1.05) Minor formal corrections to section on Nostratians and Old Europeans. 15 JAN 2019 :: (v. 1.04) Numeration error section VIII.3; reference to SNP call in Balto-Slavic; correct name of cover image for Book 3. 3 JAN 2019 :: (v. 1.03) Minor additions (references, details) in the section on Proto-Anatolians; numeration error section . 2 JAN 2019 :: (v. 1.02) Minor errors in the section on Proto-Anatolians. 1 JAN 2019:: (v. 1.01) Section Ugric and Samoyedic lacked numbering. Read the latest version, bookmarked and linked, with proper illustrations, at the official, collaborative website indo-european.info. 29/10/2017 :: (v. 3.5) Minor revision of the paper. Corrected information on PCA. Updated information on Sredni Stog. Certain maps updated. New research added. 18/9/2017 :: (v. 3.0) Full revision of the paper. Updated information on admixture. Maps updated. New sections. 10/6/2017 :: (v. 2.1) Minor corrections. Added information on Bell Beakers and Germanic. 29/5/2017 :: (v. 2) Full revision of the paper. Added information on Bell Beaker and South-East European samples from recent papers and BioRxiv. Important changes to haplogroup nomenclature and maps.